Book Review – The Husband Hunters by Anne de Courcy | Enough of this Tomfoolery! In 1883, Alva Vanderbilt, tired of the snubs from New York society, carefully planned a ball that would finally throw open the doors of the “400” to her and her husband William Kissam Vanderbilt. She decided on a costume ball, a type of event that had not been held for years, and her guest of honour would be her dear friend, Consuelo Drogo Montagu Viscountess Mandeville and future Duchess of Manchester. The viscountess was born Consuelo Yznaga, and Alva had known her since they were children growing up in the South during the heady days before the Civil War would shatter the world they knew. For weeks people talked about nothing but the ball and it emerged that the doyenne of New York society Mrs William Backhouse (Caroline) Astor was not invited. The reason for this is because the two women had not been formally introduced and etiquette dictated that the more senior woman would call on her junior counterpart first then a reciprocal call would follow. After learning that her granddaughter was eager to be invited and had been hard at work on her dancing lessons, Mrs Astor made the first move followed by Mrs Vanderbilt and sure enough, an invitation to the ball appeared. The farce above demonstrated how far the likes of Alva Vanderbilt were prepared to go to break into society, and having Mrs Astor call on her was a social triumph. But for the ambitious Alva, that wasn’t enough. She also began grooming her daughter Consuelo for a grand match: and that meant following in the footsteps of her godmother Lady Mandeville who finally became Duchess of Manchester in 1890. Alva’s machinations are one of the many case studies chronicled by Anne de Courcy in her latest book, The Husband Hunters. Subtitled Social Climbing in London and New York, not only does it deal with the well-trodden path of analysing and chronicling the numerous American heiresses who traded dollars for a title and status, but also how their parents – especially the mothers – made it their life’s mission to break into the upper echelons of American and above all New York society. By the 1870s America was experiencing an economic boom made possible by the end of the Civil War, industrialisation and population movement to the west in search of better work prospects especially in farming, mining, herding and railways among others. Many people rose from grinding poverty to wealth beyond their wildest dreams and soon began to acquire the trappings of wealth – mansions, yachts, trips abroad, jewellery, clothes, works of art and ostentatious entertaining. It was the period of the Gilded Age where luxury, vulgarity and ostentation were watchwords. The old rich in places such as Boston, Philadelphia and especially New York City looked on these nouveau riche arrivistes in horror. To the old guard, wealth was not to be flaunted and should be balanced by good works and serving as a pillar to the community, but these newbies believed that social acceptance could be bought if the price was right, and de Courcy describes how this was all done. New York society was especially difficult to penetrate and even more so under Caroline Astor, its self-styled doyenne. She was aided by Ward McAllister, a journalist who became her confidant and assisted her with planning her parties and balls. Through his journalism, he penned articles advising on behaviour, etiquette, dress and deportment but today he is best remembered for coining the myth of the “400” as a reference to the number of people who could fit into Mrs Astor’s famous ballroom and which became a byword for exclusivity. It became the goal for many a pushy social climber to break into its ranks because to be invited by Mrs Astor signalled social acceptance. One roundabout way to secure that all important invitation was to marry off a daughter to an impoverished European aristocrat. The British were preferred – not only because of a common language but also due to the exclusivity of British titles. Thanks to primogeniture the pool of titled men (both for the peerage and baronetage) was smaller than their continental counterparts and to aristocrats in need of money the nouveau was less important than the riche. And this is precisely what happened: from the 1870s to 1910, a large percentage of the peerage married American heiresses and not even Mrs Astor would dream of snubbing a titled aristocrat and his American heiress wife. De Courcy makes a convincing case for the appeal of the American heiress to cash-poor peers. 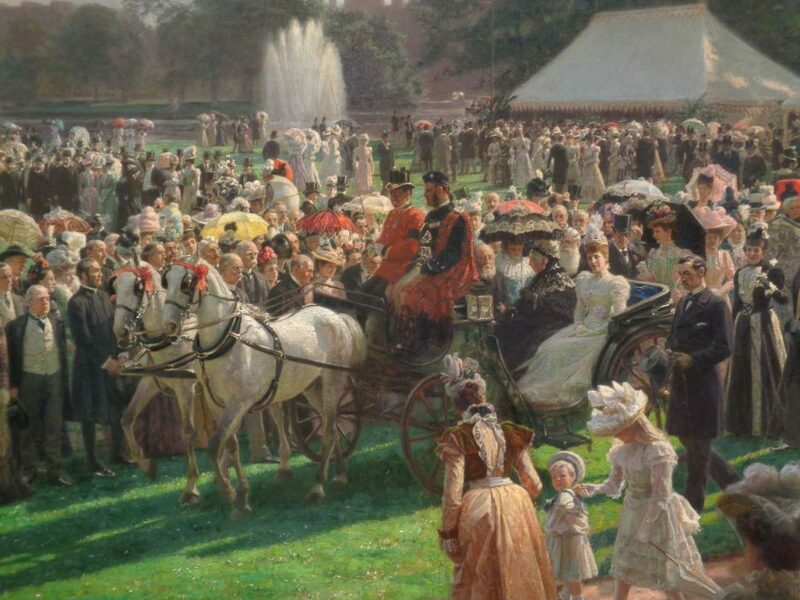 Not only were they treated equally under American inheritance laws but they were perceived as lacking the airs and graces that were the hallmark of aristocratic society. Thanks to their father’s money, they had the best money could buy in terms of clothes, jewels and experience. Many of them were also well educated and well-travelled thus being more sophisticated, confident and more at ease in conversing with people. Others had quirks and traits that allowed them to break down social barriers such as Consuelo Duchess of Manchester who could play the banjo which enlivened many a house party or dinner. However not all American heiresses were beautiful or sophisticated or intelligent. Looking at some of the photographs in the book, it is hard to believe that they would have turned heads by virtue of their looks. In the end, one can argue (and de Courcy does not shy away from saying) that money was the main deciding factor for these matches. If the heiress was intelligent, beautiful and talented it was seen as a bonus and an asset but these marriages were a straightforward exchange of status and cash. Happiness and compatibility were also not major concerns and unsurprisingly a lot of these transatlantic marriages were unhappy, with some ending in divorce. While the travails and tribulations of the American heiress turned British aristocrat has been well trodden, De Courcy also trains her eye on their mothers. American society was matriarchal, the men might have made the fortunes that raised the family’s economic status but it was the women who used the money in order to cement the social standing that they believed should go hand in hand with their newfound wealth. The phrase “keeping up with the Joneses” springs to mind as the women vied with each other to build bigger houses; acquire jewellery, works of art and paintings; wear the latest fashions and throw the most lavish balls of the season. The men were pretty much reduced to being human cash machines and had virtually no say when it came to family matters even with their daughters’ futures. It’s not surprising that many of these millionaires resorted to escaping from their own marriages metaphorically and literally. The fierce competition and relentless ambition became too much but as the 1890s rolled along, the criticism became much more strident and as the United States became embroiled in an economic recession, the conspicuous consumption of these Gilded Age personalities left a bitter taste in the mouth. By the beginning of the twentieth century there was a backlash against these transatlantic marriages and as America increasingly began to play a role in international affairs, more and more people began to realise that they didn’t need aristocratic marriages for social validation. De Courcy charts the rise and fall of the transatlantic marriage and social climbing phenomenon in thorough detail. In the end while the money the American heiresses brought into their marriages did save many a crumbling estate and some were the mothers to figures who made an impact in our history, in the long run their presence did not arrest the decline and fall of the British aristocracy. Instead they served as sticking plasters, delaying the inevitable but nonetheless nothing more than a short-lived social phenomenon. Sticking plasters on the decline of the Aristocracy. Great line. Thanks, WS. It looks like an interesting slice of history.